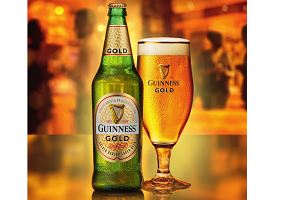 Guinness Nigeria, a subsidiary of UK alcoholic drinks giant Diageo, has unveiled the launch of Guinness Gold, a new lager designed especially for the Nigerian market. Infused with crystal and amber malt, Guinness Gold is described as offering a depth of flavour and as using the same yeast as the original Guinness stout. Commenting on the launch, Guinness Nigeria marketing director Adenike Adebola said: “We are thrilled to see the great interest in Guinness Gold that has trailed our pre-launch activities. As you will agree, we too are passionate about celebrating life’s golden moments. It is why we redesigned our brewery gate and lit up our buildings in celebration of the launch of this truly extraordinary lager beer. We welcome you to enjoy the bold flavours that you expect from Guinness with Guinness Gold”. Guinness Gold is initially being made available in selected outlets at a price of 350 NAR ($0.97) per 600ml bottle.